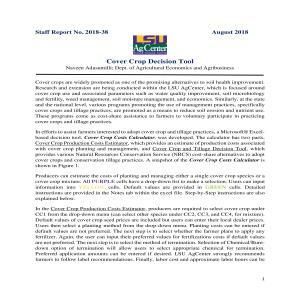 In efforts to assist farmers interested to adopt cover crop and tillage practices, a Microsoft® Excel-based decision tool, Cover Crop Costs Calculator, was developed. The calculator has two parts, Cover Crop Production Costs Estimator, which provides an estimate of production costs associated with cover crop planting and management, and Cover Crop and Tillage Decision Tool, which provides various Natural Resources Conservation Service (NRCS) cost-share alternatives to adopt cover crops and conservation tillage practices. A snapshot of the Cover Crop Costs Calculator is shown below. To use the tool, DOWNLOAD the excel file. Follow the steps in the "NOTES" tab in the excel file or the steps indicated in the PDF document.